Although vertical farming has been talked about for over a decade, technical barriers have prevented construction of these unique urban farming solutions. But for the new Swedish company Plantagon, vertical farming is no longer an elusive architectural feat. In fact, construction has just begun on the Plantagon vertical farm in Linköping, Sweden, with the hopes that urban dwellers will soon be enjoying food produced on a large-scale in their very own city. 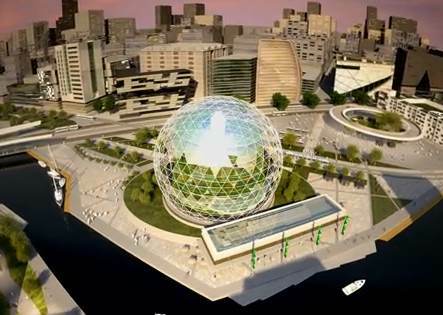 The Plantagon urban greenhouse will achieve a height of 177 feet, and boast 18 levels of vegetable gardens. In addition to providing a source of fresh food, Plantagon will also develop “integrated solutions for energy, excess heat, waste, CO2, and water in cooperation with several partners” said a news release. For years, supporters of vertical farms have been baffled with how to effectively provide an equitable distribution of light to the plants in a tall vertical structure. If the vertical farm were to rely exclusively on natural light, plants on the outside of the structure would receive more light than plants towards the middle. As a result, the crops would grow unevenly. To get around some of these technical issues, the Plantagon vertical farm situates the plants on a vertical, rotating “corkscrew” platform inside of an enormous curved-glass, geodesic spheroid structure. This design allows the plants to receive an equitable distribution of light. Although the Plantagon may not yet feature the most efficient vertical farm design, it is by far the most effective one to date. It will be interesting to see where the state of vertical farming will be in another five years.